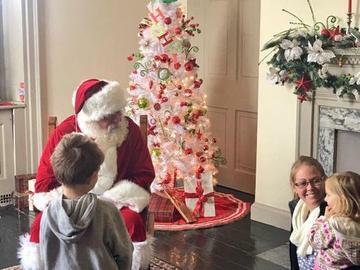 Join us at Lemon Hill Mansion as the historic houses celebrate “Family Day” with a full day of entertainment and activities for children aged 12 and under including a visit from Santa himself and a special cheese sculpture of the Flyers' mascot "Gritty" courtesy of Cabot Cheese! Lemon Hill Mansion admission is $10 per person. Free admission for children 12 and under. $25 "Family Day" passes are also available and include entry to all five houses. No further discounts are available. Additional participating historic houses include Cedar Grove, Laurel Hill Mansion, Historic Strawberry Mansion and Woodford Mansion. All houses are located within East and West Fairmount Park in Philadelphia. Visit holidaysinthepark.com/your-visit and scroll down for an interactive Google map to get directions to each of the houses. Proceeds from this event support the ongoing stewardship, maintenance, and promotion of these treasures. Visit www.holidaysinthepark.com for further information including house addresses, transportation options, and the day's performance schedule. Limited free parking is available at each location. Passes are valid for 12/3/17 only. No further discounts are available. Children 12 and under admitted free to the historic houses. Photos are encouraged! Crowd Photo Release Information: Please be aware that by attending this event, you consent to your voice, name, and/or likeness being used, without compensation, in films and tapes for exploitation (such as publicity) in any and all media, whether now known or hereafter devised, for eternity, and you release Fairmount Park Conservancy, its successors, assigns and licensees from any liability whatsoever of any nature. Please contact Ed Miller @ emiller@myphillypark.org if you have any questions or concerns.